in 2002, i lived in a big old shared house in mount pleasant. the caretaker was a super loving mom named jill and her teenage daughter, skylar. my own daughter hannah arrived soon after and became the subject of sky’s photography projects, while sky became hannah’s first babysitter. a few years later we moved across town, but i’ve often thought fondly of the quality of jill + sky’s relationship as i raise a daughter of my own. fast forward to present day and sky is the mother of a beautiful little boy. together with her husband max, they live in a townhouse in kits… where max + his own loving mom lived for many years. in 2015, sky + max decided it was time to modernize and make this home their own, so they called on mango to help with the design. the old kitchen wasn’t inspiring anyone to cook, the bathroom was blah and the whole space needed a good freshening up. we removed valances, replaced the old bamboo flooring with a beautiful natural white oak from bc hardwood and gave all the walls a fresh coat of ‘cloud white’ paint. 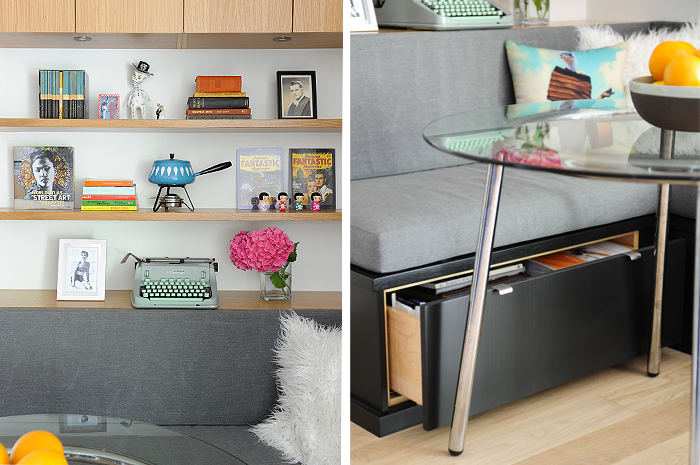 we designed our favourite area – the eating nook – with banquette seating inc drawers under the seats for much needed storage in this small townhouse. 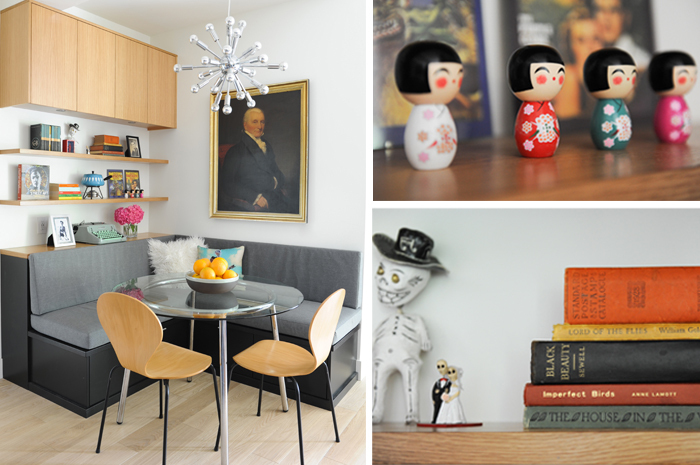 the upper shelving holds some books + curios and a fabulous heirloom portrait hangs over the space… proudly watching over this loving little family. the kitchen was cramped and the bar height counter was blocking the conversation flow. we extended the kitchen a foot or so and created a cabinetry niche around the electrical panel (hiding behind the mirror). we re-designed the new cabinetry around the existing appliances and replaced the storage closet with a built-in pantry. 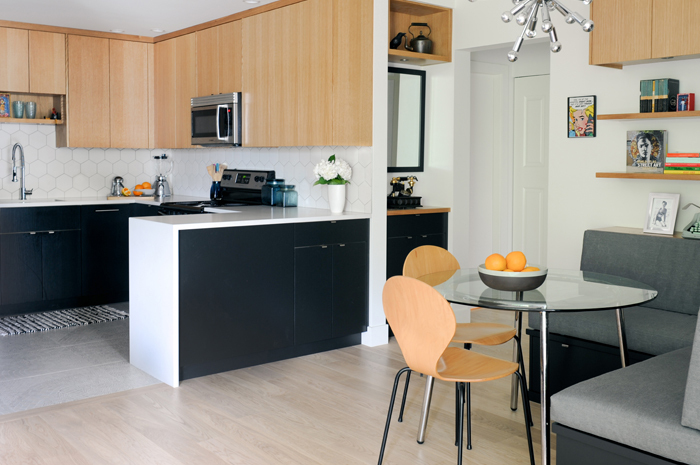 the custom millwork is all vertical grain white oak with the base cabinets stained benjamin moore’s ‘black beauty’ and the uppers kept natural. 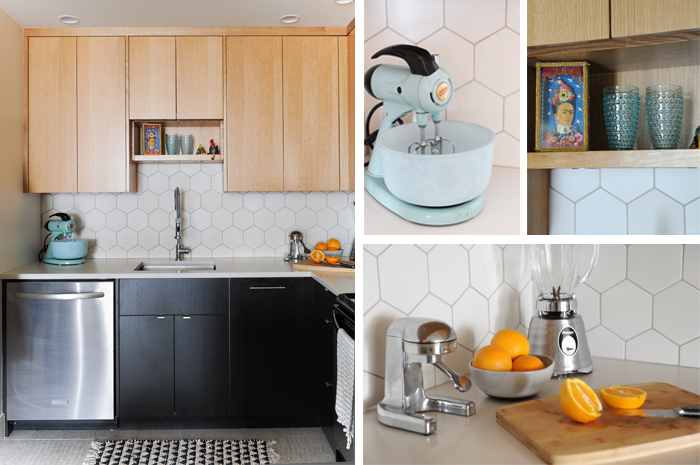 the countertop is caeserstone’s ‘fresh concrete’ and the backsplash tile is mutina’s phenomenon matte hex, also used for the bathtub surround. for some cost savings in the bathroom, we used ikea’s godmorgon vanity + medicine cabinets and added a splash of soft aqua with the hex mosaic. the sweet wall sconces are the ‘princeton jr’ by schoolhouse electric.